Free Shipping Included! Soccer Goal and Pitch Back - Indoor & Outdoor Youth Soccer Goal Net for Kids by Barcaloo at Oregon Lacrosse. MPN: BCL-SGPB37. Hurry! Limited time offer. Offer valid only while supplies last. 3 in 1 Sports Net Play street hockey, practice soccer, or train in throwing, pitching, and fielding for baseball/softball with this multi-sport net. Play street hockey, practice soccer, or train in throwing, pitching, and fielding for baseball/softball with this multi-sport net. This outdoor sport net includes a soccer ball, pitch back ball, hockey puck, 2 hockey sticks, and ground hooks for extra stability. Premium materials and solid construction ensure this soccer goal and pitchback net will last you and your loved ones for years. Help your kids develop their soccer, hockey, baseball and more skills while getting some great exercise and improving their hand-eye coordination. 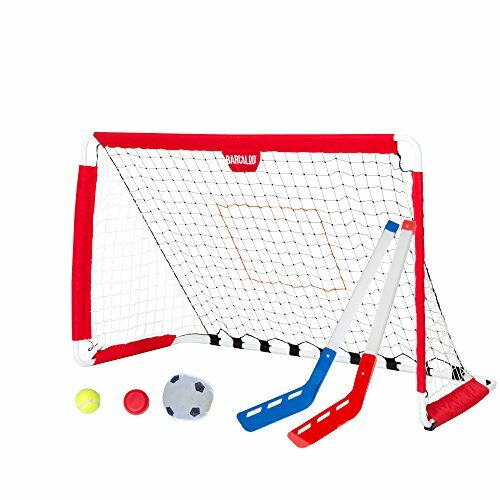 3 IN 1 SPORTS NET - Play street hockey, practice soccer, or train in throwing, pitching, and fielding for baseball/softball with this multi-sport net. INCLUDES SOCCER BALL, pitch back ball, hockey puck, 2 hockey sticks, and ground hooks for extra stability. Everything your kids need to get outside, get some exercise, and have a blast! BUILT TO LAST - Premium materials and solid construction ensure this soccer goal and pitchback net will last you and your loved ones for years. LIFETIME REPLACEMENT WARRANTY - Barcaloo stands behind all of its soccer goals 100%. If anything ever goes wrong with this baseball pitchback and soccer goal net, we will replace it with a new one. If you have any questions about this product by Barcaloo, contact us by completing and submitting the form below. If you are looking for a specif part number, please include it with your message.